For contractors and do-it-yourselfers alike, this book features professional estimates for popular exterior remodeling and repair projects. RSMeans Exterior Home Improvement Costs includes more than 65 projects with complete, customizable cost breakdowns for doing the work – with or without a contractor. You’ll have access to current costs for your location on the most popular remodeling projects, including: Room additions, garages and sunrooms Decks, patios, porches and pergolas Landscaping, sprinkler systems and outdoor lighting Fences, walls, driveways and walkways New windows and doors Roofing, siding and painting Exterior Home Improvement Costs includes a description of what materials are needed, how much they will cost, and how long the work will take. You’ll know what skills are required to do it yourself, and how much a contractor is likely to charge if you decide to use a professional. Find out which improvements have the best payback when it comes time to sell your house, and get expert tips on working with contractors and architects. 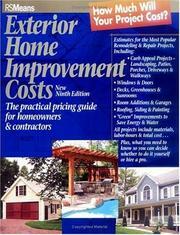 Included with the book is a handy checklist to use when selecting your materials and comparing prices.